Broader politics aside, I’ve always been of the Julie Bishop school of feminism – get on and do rather than talk. I was raised by working women: competent, intelligent, strong. Doers. Never whingers. But Julia Gillard’s so-called misogyny speech at the end of 2012 blew that up for me – not the speech itself but the deluge of negative reactions to it, some of them violent, many from women. It led me to wonder about the nature of sexism and misogyny in a way I hadn’t before, and in a heavily coded exploration of my own experiences, I began to research and write a novel on the theme, Paper Daisies, set at the time of Australian Federation and the struggle for the Women’s Vote. I needed to know how one of the first nations in the world to grant the female vote – Australia – could have been so unready for their first female prime minister. After all, Gillard’s speech wasn’t news to me, nor any woman I know. She was pretty much stating the obvious. I’ve had some appalling experiences at work – who hasn’t? I’ve been slobbered all over by a senior partner in a law firm; threatened by another boss, quite against the law, that I’d better come back to work within three months of giving birth or I’d have no job to come back to. These are terrible things, and sadly quite normal for most of us. I wouldn’t cop a lecture on sexism or misogyny from any man, either. But what is a misogynist? What sort of person truly hates women? For me, there’s quite a difference between the badly behaved man at the party – you know the one who drinks too much, tells inappropriate jokes and wants to pash you – and the charming, well-mannered one who rapes women when everyone else has gone home. I looked at both of these sorts of characters in Paper Daisies, and asked myself what, in one hundred years, has changed to help women identify misogyny for what it is and, most importantly, get the hell away from it? Apart from the right to vote, better social security and working conditions, and better divorce laws, it seems that not a great deal has changed for women in this regard. There aren’t so many more or better sign-posted safety ropes out of destructive or violent relationships today than there were then, either – and certainly not now that emergency shelters for women and children are closing across the country. When my heroine, Berylda Jones, stands in the midst of her middle-class New Year’s Eve Party at the turn of the twentieth century and looks around desperately wondering if there is anyone in the room who might help her and her sister escape the sadistic cruelty of their uncle, she comes up with the hideous answer: no. And when she did so, I spent a good few weeks sobbing, because I saw that Berylda was, in this sense, me. Although it was a long time ago now, I have been that woman at the party not knowing where to turn. Just like my heroine in 1901, I had to shut up and get on with things while devastation unfolded behind closed doors. I have been too frightened to speak out, and in many ways I still am. But the great thing about fiction is, of course, you can throw your heroine that rope out, and I found a great deal of pleasure in making Berylda a brilliant student, a witty and soulful woman, destined to find a way through. It was a need in me that felt increasingly urgent, too, as the tragic murder cases of Jill Meagher, Lisa Harnum and Alison Baden-Clay unfolded across my writing days. What I now understand is that silence in the face of misogyny is dangerous. It crushes, and it kills. 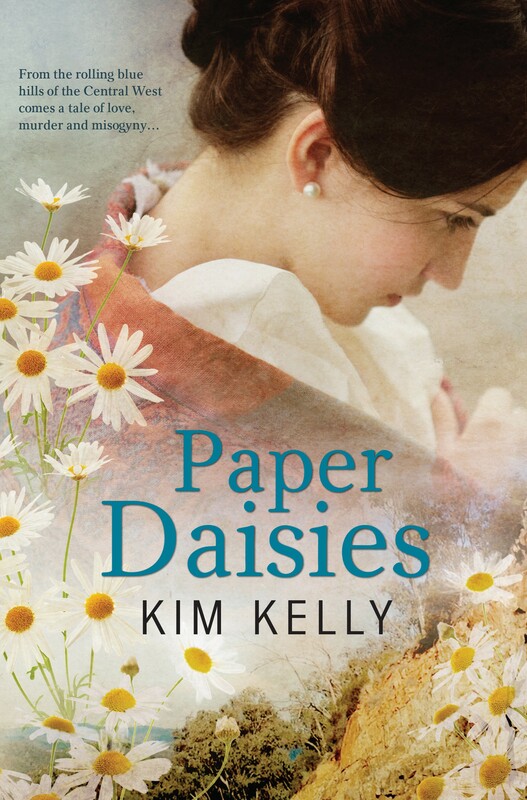 It comes to a very deadly end in Paper Daises, but I won’t spoil that for you here. Suffice to say, I found the job of feminism is in no way complete. No magic line has been drawn at the granting of the vote or equal pay to say that we are free of hatred against women and the social prejudices that allow it to fester among us. Through the winding road of research and reflection, I also came to see with clearer eyes that feminism isn’t a stand-alone show. It requires the support of men and the honesty of women to achieve anything, and to maintain any achievements past. Like me in real life, Berylda gets her good and lovely man in the end (I couldn’t possibly write a novel in which that does not occur), but he’s not one who fixes the problem for her – he’s one who clears the path ahead of her so that she can fix it herself. This argument about the worth of feminism today and the definition of misogyny can all get a little bit shouty. We live in a culture of outrage at the moment, it seems. ‘How dare she raise the gender card!’ some will cry, and I can only reply, well, justice is a whole house of cards, isn’t it – one we happen to live very much inside. We need to maintain it carefully, and with love, for all our sakes. We need to look after each other, and be on the lookout for those in need of safety – today and always – because awful things happen when we don’t. I am asked the question about HOW I come up with plots all the time. Readers love to know. This is an excellent post on just that. The novel I am writing, set in the first years of the 1960s, deals with discrimination against women and their vulnerability. It is based on what I have seen and heard, and read about. I hope I can do justice to the topic.